Bersangliere Carbine M 1844, 1847 and 1857 and M 1844 artillery rifle. Serial number 288 R on crossguard. Very good double edged non fullered greying blade marked on both sides of the ricasso with very small inspection markings. Excellent massive brass hilt with crossguard with two short quillons. Mortise slot to the left side of the grip. Steel press catch and blued leave spring secured with a srew. Pommel is marked 58 and inspection markings. Black leather scabbard with excellent toolings and brass fittings without serieus dents. Top mount with its brass frog stud is marked wit a small F in a circle. Chape is marked CD ina circle. There is an imperfection of the leather scabbard between the scabbard body and the chape, but the scabbard is not broken and the chape is not loose. Al stitches intact. 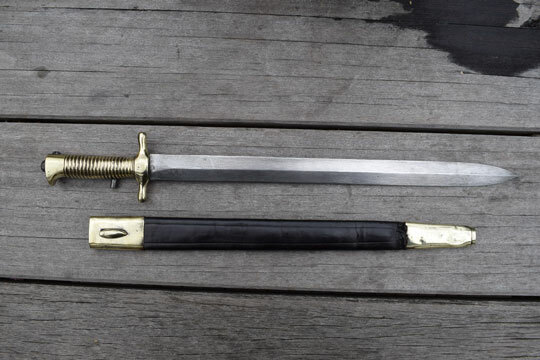 Very rare and atractive heavy bayonet. Scabbards are extremely rare.